Taking your pet pooch on holiday is all very well but it can sometimes be tricky to find somewhere to eat that will allow them inside. We’ve gathered together five lovely dog-friendly pubs and restaurants to visit while you are on holiday in Mid Wales with your four legged friend. Y Talbot in the depths of the Cambrian Mountains at Tregaron is a perfect spot for a stop if you’ve had a day exploring the beaches of west Wales. It’s an old drover’s inn, the very name means dog! A Talbot dog was a large dog, often white and was used to deter highwaymen from attacking coaches or very possibly drover’s returning with their gold from selling stock at one of the border markets. Known locally for its superb menu, it is definitely a pit stop to keep in mind during your holiday in mid Wales. The Seven Stars at Aberedw is tucked deep in a valley not far from the ancient market town of Builth Wells. Craig and his family welcome dogs. After stretching your legs and building up an appetite on the beautiful Wye Valley Walk you can rest weary limbs with your walking companion stretched out in front of a roaring log fire! 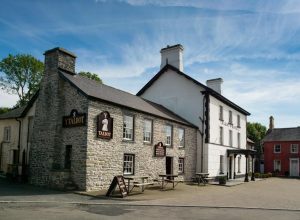 The Fforest Inn at Llanfihangle Nant Melan is another drover’s inn on the long walk from Wales to the markets of the Midlands. Steeped in the local folk lore of Silver John, Colin and Nikki make you very welcome (even a sign on the door saying We Are Dog Friendly) if you drop in for a pint or pub meal with your dog. A day trip to Aberystwyth or Devil’s Bridge is made complete with a call for a bar meal at The Druid Inn in Goginan. This warm and welcoming Welsh pub expects dogs to be lying in front of their fire! The food is freshly made and delicious and they have Butty Bach on draft! With words like ‘Yummmmmm’ and ‘top notch’ this is definitely one on the to call at list. A very favourite place to visit in mid Wales is the Elan Valley, it must be high on the list for spectacular scenery and wonderful walking. The Triangle at Rhayader is a welcome sight for you and your dogs after a day walking the hills and valleys of the Elan. Alison will make you welcome, winter log fires and summer cooling slate flags for your dog to rest his limbs on. This must be the only pub in Britain where you have to cross a small road to go to the loo! We’d love to hear about any of your favourite dog-friendly pubs and places to eat in mid Wales, please feel free to share in the comments!